This was my first real Trialthon since the Ironman Canada last year. I'd first heard of this race just before I'd done Wildflower for the first time a couple years ago, so this had been on list of races to do for a while. Was it really the World's Toughest? I was going to find out. I arrived up there the night before with a teammate who I'd convinced to join me. It was a very early start to get ready, pick-up the race packets and drive to the start of the race. It was really done to the last minute, literally. The starting gun fired and I was just making my way down to the water. Before I knew I was swimming with the pack and getting appropriately knocked about. The water was calm and a good temperature. The course was a big loop so I wasn't constantly trying to site the next buoy. As swims go this was a long one. It turns out I wasn't only one who thought that, I heard others saying in transition the course had been mis-marked and was actually 1.5 miles long. 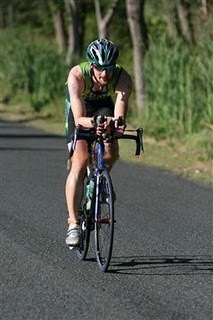 Glad to be out of the water and on the bike I started up the hill. The course was a straight out and back, though finishing at point 8 miles uphill from the swim. Uphill was what this course was all about. The first twenty five miles were all cliombing, I was enjoying this is what I like. I wasn't far from there turnaround when I saw a rider screaming downhill in the opposite direction. There was also a car coming downhill about to turn across the road. I'd speed uphill so that wouldn't be in the way. I found what happened next to be startling, the car and bike now just behind me on the other side of the road had collided. The rider had gone into the side of the car as it was turning. It stopped and turned back to see what I could do. Others were on scene very quickily, I gave a report to the police of what I seen and continued on unerved by what I had seen. The rider was seriously injured but not critically, he was quickily taken to hospital. Trying to keep my mind on the race, though I was thinking more about safety than racing, I finished the ride. On to the run course the temperature was now in the high 90's and I felt I was metling. It started on some trails and then on to a paved road, a two loop run with a number of short climb. The rest stops were passing out chill water and cold sponges. 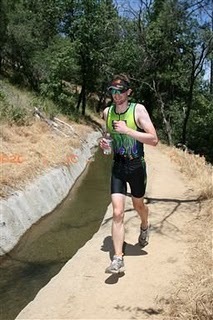 I hot and my legs were tired but I felt generally pretty good, at least relative to past races. The run course due to it's overlapping nature was full of people in both directions I had a chance to chat with a couple people as I ran long to pass time. Not my fastest run but I wasn't going to complain about 10minute mile in these conditions. I ran up the final hill with a burst of energy and finished the race. Despite everything I managed to place third in my age group!